I am the youngest child in my family and the only girl. I have two older brothers who both live far away. My brother Gordon lives in Michigan and my brother Glen lives in New York City. If you ask my Mom who is her favorite of the three of us she will probably say she loves us all the same. However, we all know that Mom has a favorite! It is the "golden" middle child, Gordon. This past weekend it was my brother Glen's birthday. Since Glen lives in New York City, I rarely get to spend time with him. Whenever I do I can count on one thing.....I will laugh until I cry. Glen is hysterical, the life of the party and so much fun to be around. Glen has an infectious laugh. Even though the photo about is blurry it is one of my favorites! It just shows that the person taking the picture was probably laughing too because of something Glen said. So my goal for his birthday card was to send him something that would make him laugh! 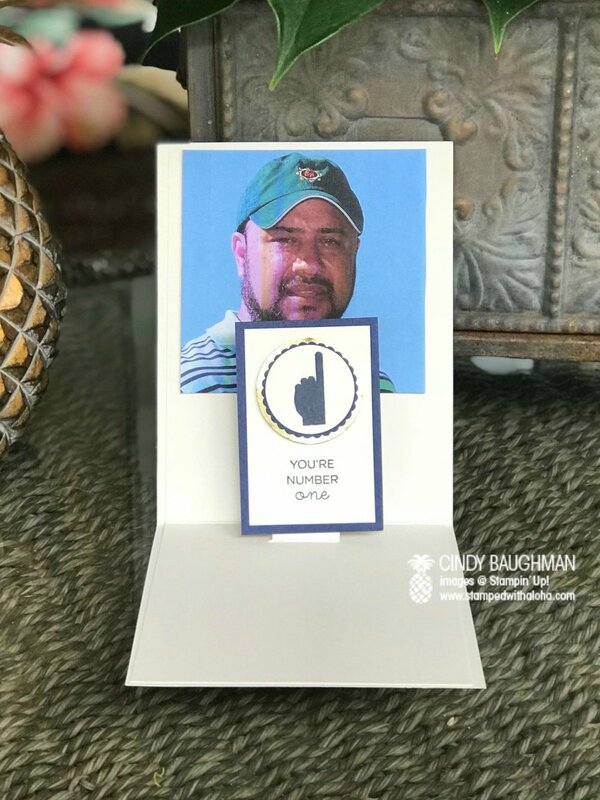 I thought about our "Mom's Favorite" sibling situation and decided to make him a card using the World's Best Trophy stamp set. This stamp set is great because you can combine many different stamps to create personalized trophies to celebrate the ones you love. Here is the personalized creation I made for Glen. This card uses Designer Paper from our True Gentleman Suite. I personalized this card by stamping the word "brother" under the stamp that said, "World's Greatest". I added a gold foil paper border to give this card a shiny look that would resemble a golden trophy. If you look closely at the background design on the top it was made by stamping Night of Navy ink on Night of Navy card stock. Here is a close up of the stamps I used. Over and over again, I stamped the words, "you're number one". Well, I can just see it now. My brother Glen, holding this card, seeing the trophy and reading the words "world's greatest brother". I bet he smiled and said out loud, "Awwwwwwwww". A picture of Gordon, the Golden Child, with a "popped up" sentiment that declares something we all are well aware of. He is the favorite child. I signed Glen's' card, "Happy Birthday, from someone who knows what it is like to not be Mom's favorite!!!" Glen contacted me after he received this card and told me how funny he thought it was. I know when Gordon see's it he will say that this is the most accurate card I have ever created. He will probably request I make this same card for him when its his birthday! Favorite or not, I am blessed to come from such a loving family and I am thankful we can have fun with each other like this!! I am also thankful to to have such wonderful Stampin' Up! products to work with that allow me to make personalized creations to bless the lives of those I love.